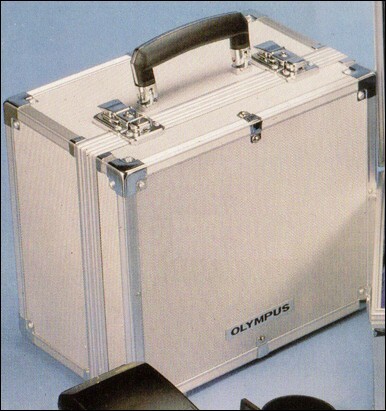 Olympus produced 2 fitted aluminium cases to hold a camera and an assortment of equipment. The cases were lockable, made of heavy-gauge aluminium with reinforced corners and edges, and the compartments were lined with royal blue plush. The cases were available empty, and as complete outfits. Both cases were the same depth and height, but Case B was nearly twice as wide as Case A.